You've heard the stories, seen the pictures, now SEE the Movie! We had so many awesome views from the trails. If we weren't in so much pain, I'm sure we would have enjoyed them so much more. 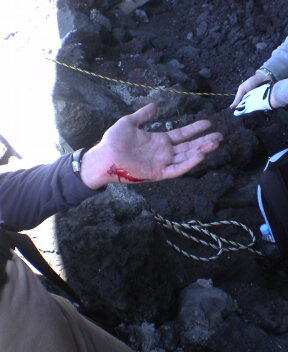 No one really knows what happened, some say he slipped, but Ed insists that the team was attacked by a bobcat and he saved us all. Either way thank you Ed for your sacrifice! 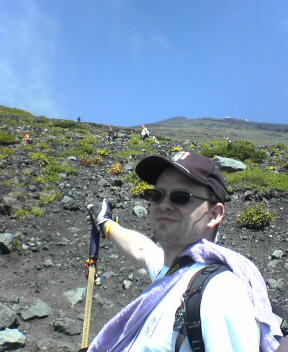 It was a beautiful sunny day for our hike back down, but at altitude the sun was also brutal. 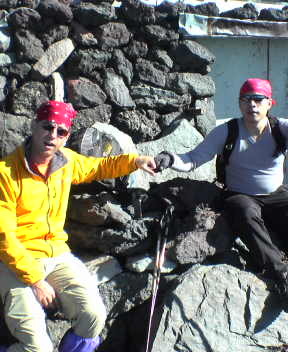 Doug and Barry go "gang" to try to ward off the rays. Peace Brother! 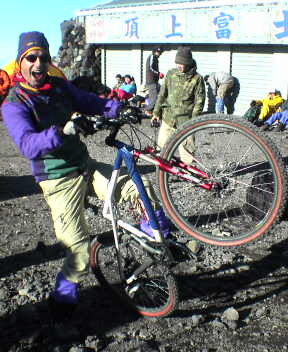 We met a kid who carried his mountain bike up to the summit on his back! Doug couldn't resist borrowing it for a spin. The trail was so bad the kid ended up carrying the bike back down! 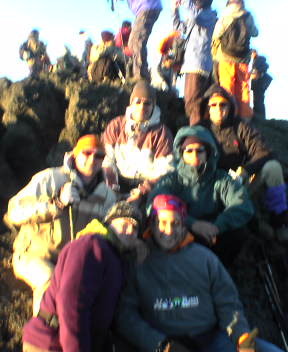 From the "top" were we saw the sunrise, we still had to hike about a half hour to reach the summit. 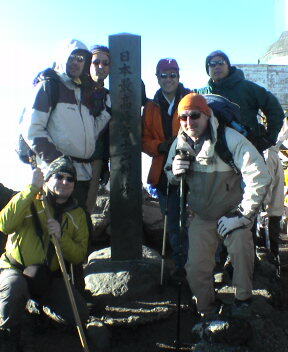 Here is the team at 3776 meters! We made it!! 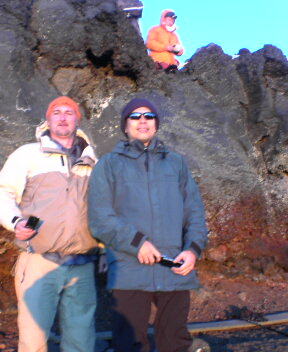 With Fuji-san being a volcano (fortunate for us an un-active one for the climb) it has a huge crator on top. There was some talk about throwing someone in, but noboday had enough strength to do it. 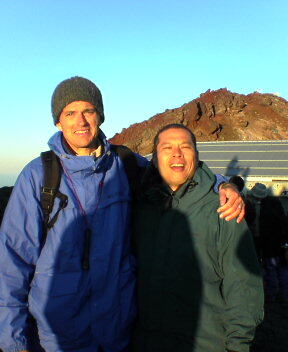 Barry runs into a friend at the top of Fuji-san. Who wudda thunk it. 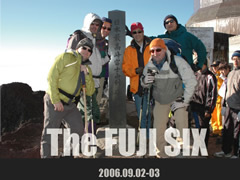 Here is the team together on top of the mountain. We did it!!! 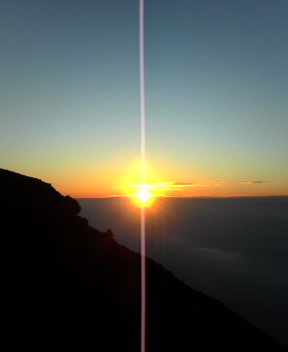 I would estimate there were well over 100 climbers up to see today's Sunrise. 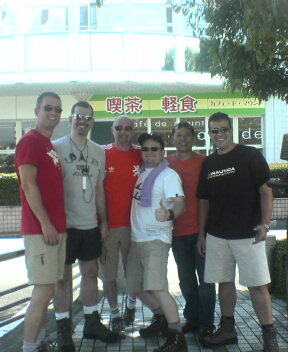 Even many Gaijin groups. 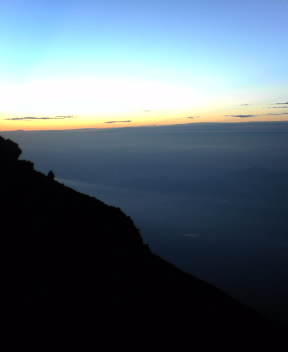 Picture taken at 5:15 as the sun rises over a clear blue sky. Truely a fabulous sight. 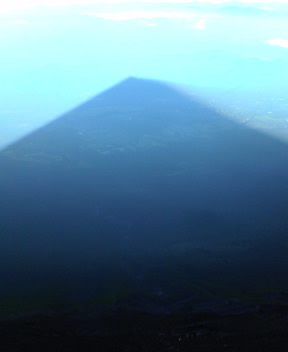 Well worth the climb up to see it! 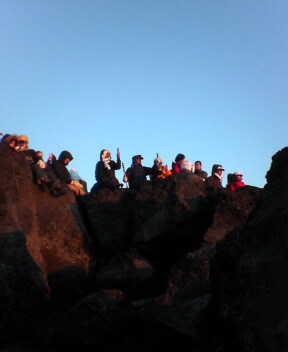 We get some places amoung the hundred or so people who have also climbed to see the sunrise. 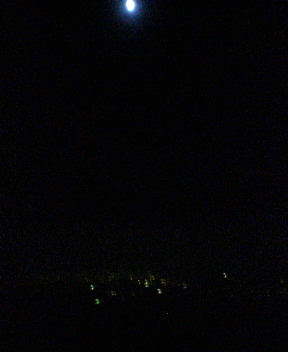 We can see directly East as tht sky gets light. 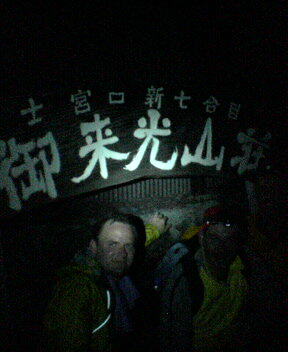 Tori Gate at The Top! 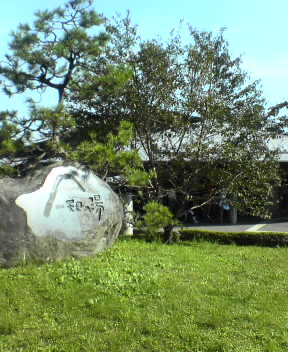 At 4:53 we pass through the Tori Gate at the top. We made it!! The sky is starting to brighten and Sun Rise should be around 5:15. So just in time! 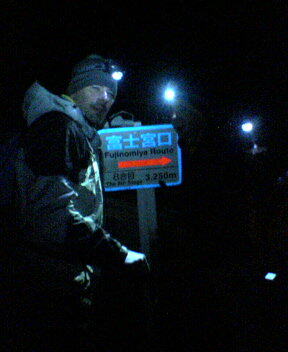 Tori Gate to the Top! 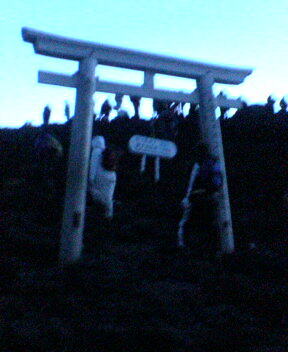 At 4:20 we pass through the Tori Gate on the path to the top. 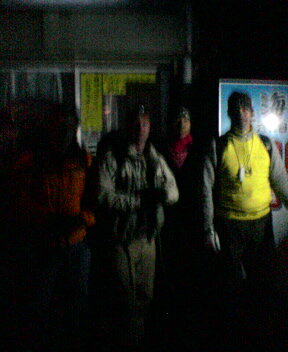 And quickly join a long line of people walking with Head Lamps to the top of Fuji-san. 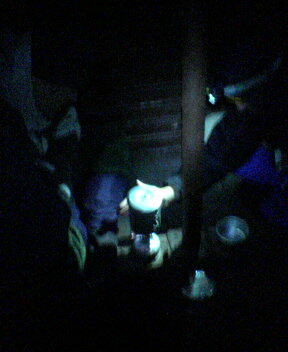 Nathan brought a camping stove, so in the chill of Station 9 we all had a cuppa. Wild Berry Cheery was the choice for the night. 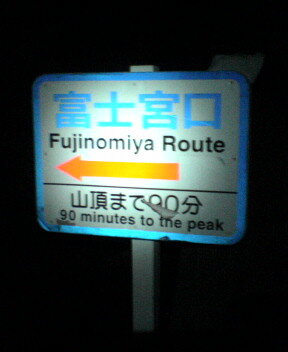 Around 3am we see sign that on the path that states 90 mins to top. 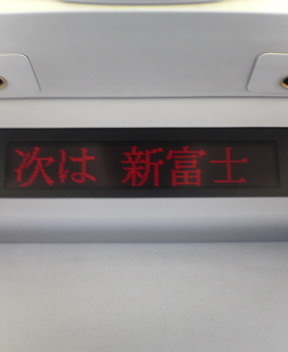 But when we reach Station 9 (30mins later) we see the same sign! 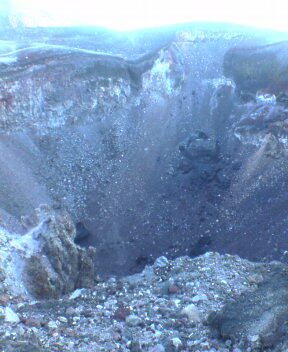 Will we ever make it to the top!?! 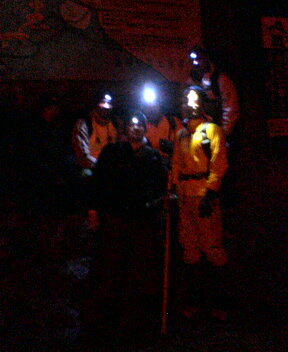 We made it to Station 8 at 1:36 this morning. 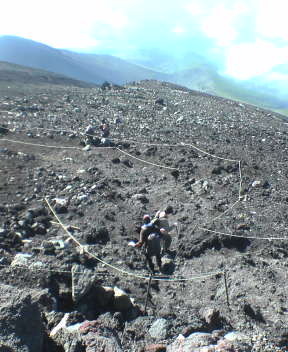 Rested and altitude adjusted for an hour. Then off for 9. 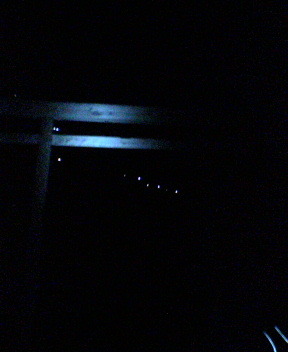 It turns out that there is no cell phone reception above Station 7 so the blog couldn't be updated. 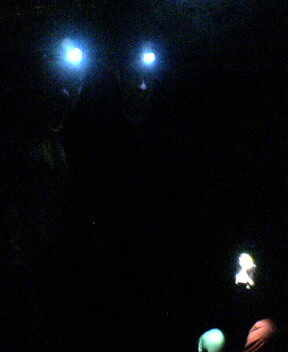 We are down off the mountain, and the many pictures of our adventure will be posted soon. 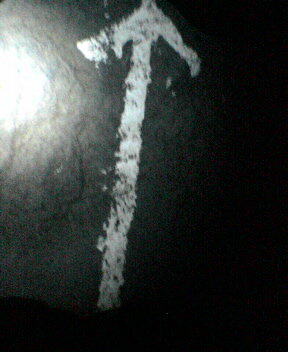 In case you loose your way. 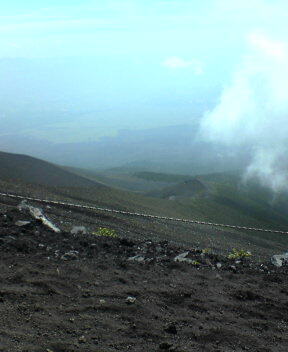 From Station 5 looking over Fuji City. 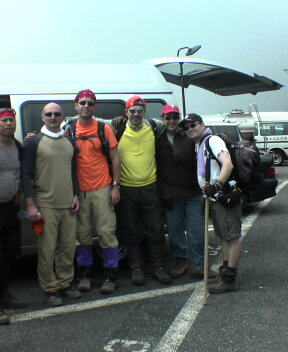 In the van at Station 5. 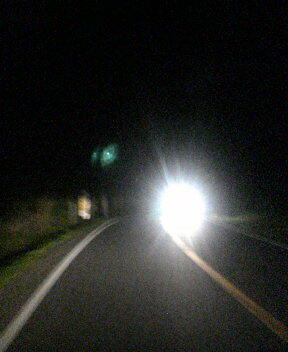 The long and winding road. jan,jan. 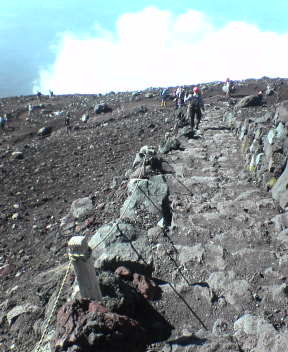 Road up to Station 5. 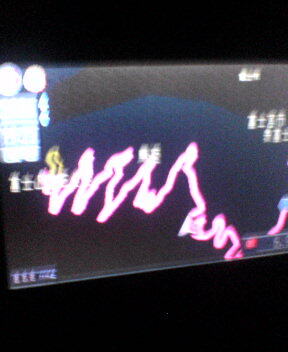 The team has Chinese for dinner to enhance their strength for the all night climb. 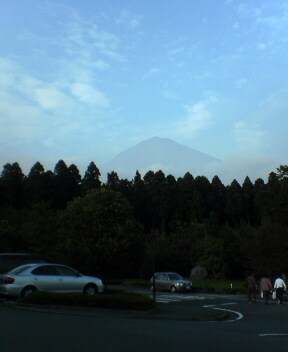 The clouds clear and Fuji-san comes in to view! 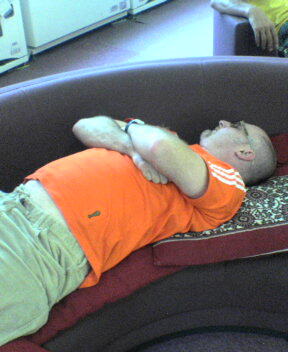 Ed purifies himself in his own way. Here we go through the ritualization of purification of our bodies, before ascention to purify our souls. Mike and Barry check out the wheels. 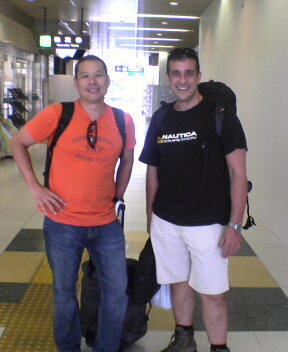 Mike and Barry arrive at Shin-Fuji Station. The team is assembled! 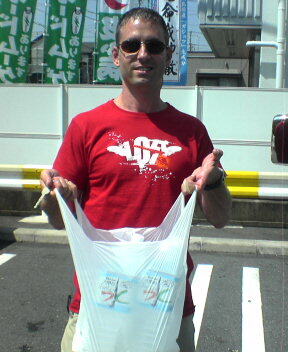 Hitting the 7/11 to stock up on water. Doug gets us some wheels. 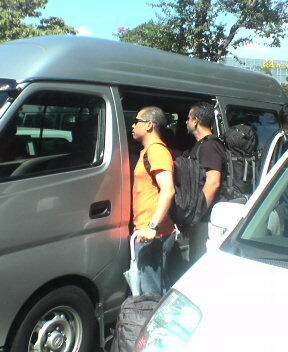 The first part of the team arrives at Shin-Fuji. 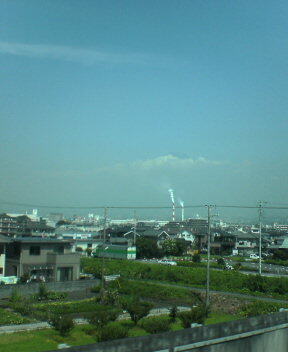 Here is Fuji-san seen from the train. You can just see it peaking above the clouds. Looks sunny on top! 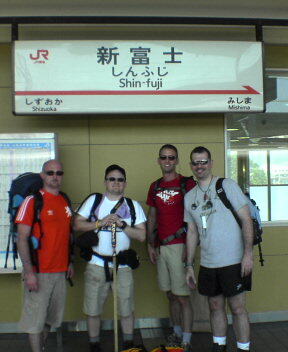 Next stop, Shin-Fuji Staion. Almost done with trains.